This is about the English musician; for others, see Dave Davies (disambiguation). Dave Davies (born David Russell Gordon Davies, 3 February 1947, Fortis Green, London) is an English rock musician (singer and lead guitarist), best known for his membership with the English rock band The Kinks. In 2003, Davies was ranked 88th in Rolling Stone magazine list of the "100 Greatest Guitarists of All Time"
Davies was born at 6 Denmark Terrace, Fortis Green, London. He was born the last of eight children, including six older sisters and an older brother, later bandmate Ray. As children, the Davies brothers were immersed in a world of different musical styles, from the music-hall of their parents' generation, to the jazz and early rock n' roll that their older sisters listened to. The siblings developed a rivalry early on, with both brothers competing for their parents' and sisters' attention. Davies grew up playing skiffle, but soon bought an electric guitar and started experimenting with Rock. The Davies brothers and friend Pete Quaife would jam together in the front room of their house. Activities in the Davies household centered around this front room, culminating in large parties, where Davies' parents would sing and play piano together. The front room and these parties were musically nurturing to the Davies brothers; later influencing The Kinks' interpretations of traditional British music like Music Hall. Dave and his brother worked out the famous two-note riff of their 1964 hit, "You Really Got Me", on the piano in the front room. Davies founded The Kinks with Pete Quaife in 1963. His brother Ray, who became the best-known member and de-facto leader of the band, joined soon after. The quartet was formed when drummer Mick Avory joined. Dave Davies had a turbulent relationship with Avory, one of the reasons behind the latter's departure from the band in the mid 1980s, although the two had been roommates together in the mid 1960s. Ray and Dave Davies would remain the only two steady members of the band (with the exception of Avory until his departure) throughout their run together, with a frequently changing roster of bassists and keyboardists. Davies played a largely subordinate role to his brother, often staying behind the scenes. Davies would make occasional contributions on Kinks records as lead vocalist and songwriter, with cases such as "Death of a Clown" and "Strangers". "You Really Got Me" was the group's third released single, after two unsuccessful ones that failed to chart. The single was a massive hit, topping the charts in the U.K. and reaching #7 in the U.S. The Kinks released three albums and several EPs in the next two years. They also performed and toured relentlessly, headlining package tours with the likes of The Yardbirds and Mickey Finn, which caused tension within the band. Some legendary on-stage fights erupted during this time as well. The most notorious incident was at The Capitol Theatre, Cardiff, Wales in May 1965, involving drummer Mick Avory and Dave Davies. The fight broke out during the second number of the set, "Beautiful Delilah". It culminated with Davies insulting Avory and kicking over his drum set after finishing the first song, "You Really Got Me". Avory responded by knocking down Davies with his Hi-Hat stand, rendering him unconscious. He then fled from the scene, and Davies was taken to Cardiff Royal Infirmary, where he received 16 stitches to the head. Avory later claimed that it was part of a new act in which the band members would hurl their instruments at each other. Davies would remain with the group as they steadily evolved, as Ray's songwriting skills developed and he began to lead the group in a whole new direction. The group would abandon the traditional R&B/Blues outfit and adopt a more nostalgic, reflective style of music, as showcased in songs like "Autumn Almanac" and "Waterloo Sunset", as well as their LP The Village Green Preservation Society. In July 1967, Davies released his first solo single, credited entirely under his name, (although co-written by his brother and fellow Kinks member Ray Davies) entitled "Death of a Clown". In the past as a member of The Kinks Dave Davies had only released his own compositions on B-sides and as part of albums. The Kinks' record label sensed potential sales in a solo release from the overlooked Davies, and issued "Death of a Clown" as his debut. Although credited to Davies, it was technically a Kinks recording, as his backing band was The Kinks. Upon its release, "Death of a Clown" rose to number three on the UK Singles Chart. Wanting to profit off of the new buzz suddenly surrounding Davies, a solo LP was slated for release some time in 1968 or 1969. The follow-up single, "Susannah's Still Alive", was released in November 1967; however, it only reached #20 on the Melody Maker chart. The release of the solo album was held back, and it was decided to wait and see how another single would fair. As anticipation grew for the release of the new LP, fans nicknamed it A Hole in the Sock Of. "Lincoln County" was chosen as the next single, but failed to chart. By the time one or two more singles were met with the same results, a combination of Davies' own disinterest in continuing and Pye's decision to stop killed off any hopes of an album. The Kinks Are the Village Green Preservation Society and Arthur were released in 1968 and 1969, respectively. Although they received unanimous acclaim, Village Green failed to chart internationally, and Arthur was met with a mediocre commercial reception. These records, although praised by critics and the rock press, were commercial failures. At the Rainbow Theatre, 1972. Davies grew a beard while on vacation in Spain during August 1971, "further distancing himself from the band's 1960s pop image" (Doug Hinman). After Arthur, The Kinks would make a comeback with their hit single "Lola" and the accompanying concept album Lola versus Powerman and the Moneygoround, Part One in 1970. Dave would record two songs of his own for this LP, the acoustic "Strangers" and the hard-rocking, proto-punk "Rats". The rootsy country-rock, and Americana themed Muswell Hillbillies was released in late 1971, and was well-received with critics, but failed to sail strongly.to a large theatrical ensemble with their records Preservation (Parts One and Two), The Kinks Present A Soap Opera and Schoolboys in Disgrace. The Kinks would leave RCA records in 1977, switching to Arista. The group shed all of the Backing vocalist and brass that had accompanied them throughout their theatrical years, and reverted to a 5-piece rock group again. Their debut LP for Arista was entitled Sleepwalker, and was a commercial and critical comeback for the group. It was the first album in what critics usually call the "arena rock" phase of the group, in which more commercial and mainstream production techniques would be employed. Dave would later comment that he was glad to be back to more guitar oriented songs, and he has listed it as one of his favorites. Davies would see the group through both success and failure, as they reached their commercial peak in the early 1980s. The group began adjusting their commercial methods, embracing the MTV culture that was selling records at the time. The music video for their 1982/83 single "Come Dancing" helped hoist the record to #11 on the U.K. charts, and #6 in the U.S - their biggest hit since "Tired of Waiting for You" in 1965. The song was a nostalgic look back at childhood memories of the Davies brothers, remembering their elder sisters going out to dance at the local palais, and coming back home to the front room at 6 Denmark Terrace. Bob Henrit was brought in to take Avory's place. At Ray Davies' invitation Avory agreed to manage Konk Studios, where he also served as a producer and occasional contributor on later Kinks albums. The group switched to MCA records in late 1985, and began work on their next album, Think Visual. The record was released in 1986, but only reached #81 on the Billboard charts. Critics were lukewarm towards it, and it did not receive significant radio play. Stephen Thomas Erlewine of Allmusic.com would later comment that the album "represented an artistic dead end for the Kinks, as Ray Davies continued to crank out a series of competent, but undistinguished hard rockers." Dave Davies contributed two songs to Think Visual, "Rock 'n' Roll Cities" and "When You were a Child". Rock 'n' Roll Cities was chosen as the lead single for Think Visual, and at its release it received a fair amount of play on mainstream rock radio. Davies and Mick Avory seemingly reconciled, as Davies asked him back to play drums on this track. The group would record several more records for MCA, their last studio effort for them being 1989's UK Jive. UK Jive was received slightly better than Think Visual, but it failed to enter into the Top 100. Dave Davies contributed the song "Dear Margaret" to the record. The group left MCA and struggled to find a record label that would accept them. All four original members were inducted into the Rock and Roll Hall of Fame in 1990, but this failed to revive their career. Eventually The Kinks signed onto Columbia records, who released their final studio album together, Phobia, on April 13, 1993. Despite lots of publicity pushing and press attention, the record was unsuccessful, peaking at #166. Singles released failed to chart as well, mainly due to a record label mix-up that delivered the records to store a few weeks late. To Phobia Davies would contribute the songs "It's Alright (Don't Think About It)" and "Close to the Wire". Columbia dropped the group in 1994, forcing them to retreat back to their old Konk Records. The group released To The Bone on the small independent Grapevine records in 1994. The Kinks eventually disbanded in 1996. After the aborted solo effort, Davies' solo career was not revived until 1980, with the release of Dave Davies (AFL1-3603), which featured Davies performing all the instruments by himself. The album was named after its own serial number. AFLI-3603 peaked at #42 on the Billboard 200. He went on to release Glamour (1981), which charted at #152. Davies brought in a back up band to play with him on this record. Chosen People was released in 1983, but failed to crack the Billboard 200. Davies released his first true solo studio album in twenty years, Bug, in 2002. Fractured Mindz followed in January 2007, his first album of all new material in nearly five years. It was also his first new studio effort since his stroke in the summer of 2004 besides the track "God In my Brain" (which was recorded and released on the compilation album Kinked in January 2006). In February 2010, Davies released a DVD, Mystical Journey. His planned US tour in support of the release was postponed per doctor's advice. Davies has played a number of guitars over time, the most recognizable of which is his Gibson Flying V. Davies bought it in 1965, and soon began appearing live and on TV performances with it. Davies was one of the few guitarists who played Flying Vs at the time. It was, in that period, out of issue due to lack of interest upon its 1958 test release, and models were numbered. Guitarists like Lonnie Mack, Jimi Hendrix, Albert King and Davies himself helped stir interest in the instrument, and it would eventually become one of the signature guitars of the Heavy Metal genre. 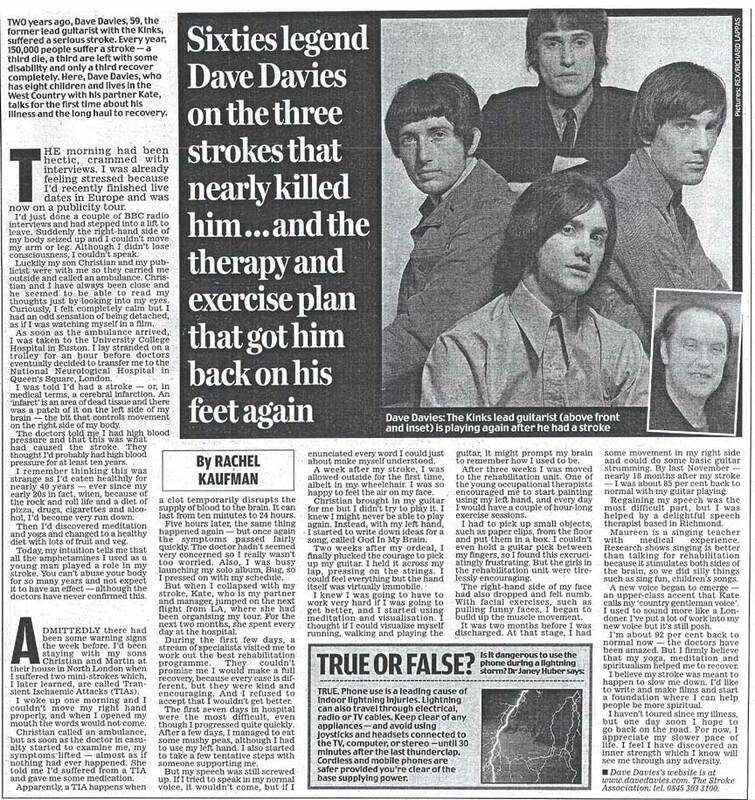 -Dave Davies, Daily Mail, October 10, 2006. By 2006, Davies had recovered enough to be able to walk, talk and play guitar. He will return to touring in 2010, playing a few gigs in New York and New England, as well as one in Los Angeles. He is a friend of horror director John Carpenter, and his work is featured on Carpenter's remake of Village of the Damned. Carpenter also acted as godfather to Davies' son, Daniel. Daniel is the singer and guitarist in the hard rock band Year Long Disaster. Belly Up (2008) - recorded live at the Belly Up Club in San Diego on 29 April 1997, which was at the start of Davies' first major solo tour of the United States. ^ "Rolling Stone 100 Greatest Guitarists of All Time". http://www.rollingstone.com/news/story/5937559/the_100_greatest_guitarists_of_all_time/42. ^ a b X-Ray, The Unauthorized Autobiography, Ray Davies. ISBN 1-58567-939-9, 9781585679393. ^ a b Interview with Mick Avory. ^ a b c d e f Allmusic Biography of The Kinks. ^ Lyrics and Songwriting credits for "Death of a Clown"
^ Lyrics and Songwriting credits for "Strangers"
^ a b Kindakinks.net liner notes for T.A.T.N.W. ^ A blog with details on the track listing and release of this Andy Desmond album. The entry is a few paragraphs down. ^ Roberts, David (2006). British Hit Singles & Albums (19th ed.). London: Guinness World Records Limited. p. 142. ISBN 1-904994-10-5. ^ a b UK releases: "Lincoln County" and "Hold My Hand" were UK/European releases and were not released as singles in the U.S.
David Russell Gordon "Dave" Davies (born 3 February 1947 in Fortis Green, London) is an English rock musician who is most famous known as the lead guitar player in the English rock group called The Kinks. In 1990 Davies, along with the other three original members of The Kinks, was inducted into the Rock and Roll Hall of Fame. In 2003, Davies was listed at 88 in Rolling Stone's list of the "100 Greatest Guitarists of All Time." ↑ "Rolling Stone 100 Greatest Guitarists of All Time". http://www.rollingstone.com/news/story/5937559/the_100_greatest_guitarists_of_all_time/42.